The new 911 is lower to give it a more dynamic appearance. Porsche today revealed pictures and details of a new lighter, more fuel efficient and powerful 911 Carrera ahead of its debut at next month's Frankfurt auto show. At first glance the new 911 looks very much like all the previous generations of the car first launched in 1963. But the latest version of the iconic sports car is slightly larger than the current car with a lower stance that gives it a more dynamic look. Porsche said the 911 has been completely redesigned. It has a 100mm (3.9 inch) longer wheelbase and a wider front track that allows it to sit even more solidly on the road. Porsche sources said the 911 was made larger so there's enough room for a hybrid-electric powertrain. It also gives the car a roomier interior with more rear-seat legroom. The 911 has a new, lightweight body made from aluminum and steel instead of the all-steel structure of the current car. Porsche said the new body is significantly more rigid than the current car's and it significantly contributes to a weight reduction of up to 45kg. 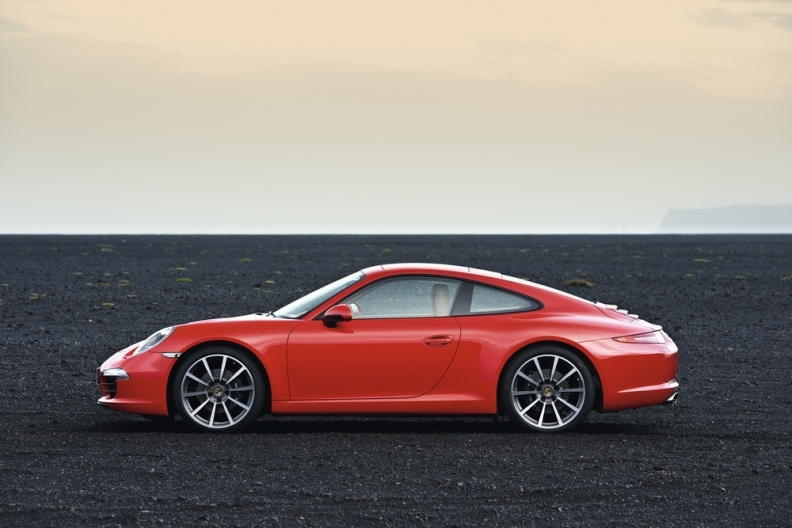 The 911 will be offered with a seven-speed manual transmission, a world first, Porsche said. 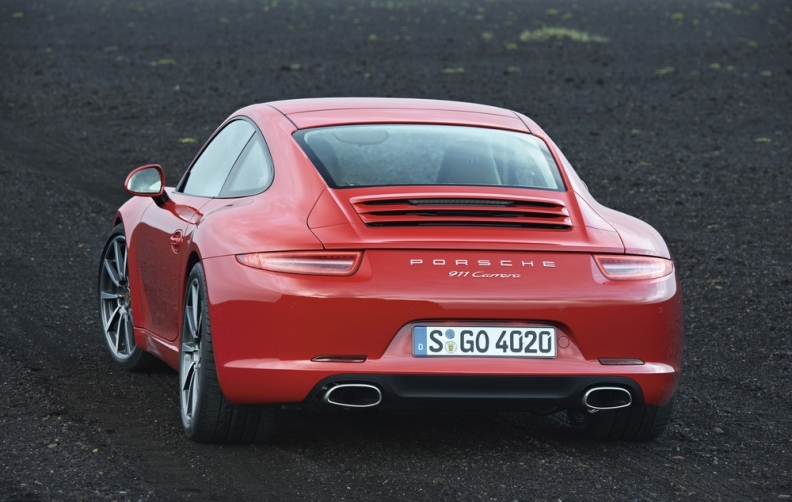 The 911 has improved aerodynamics by mounting the side mirrors on the doors. The capacity of the rear-mounted six-cylinder boxer engine has shrunk to 3.4-liters from 3.6-liters, but its performance has been increased to 350 hp from 345 hp. The 911's fuel consumption and CO2 emissions are up to 16 percent lower than the current car. All variants use less than 10 liters of fuel per 100km (28 UK mpg; 23.5 U.S. mpg), helped by stop-start technology and brake energy recuperation. The version with a 350-hp. 3.4-liter engine coupled with an optional PDK dual-clutch transmission is the first Porsche to have CO2 emissions of less than 200g/km at 194 g/km. It uses 8.2 l/100km (34 UK mpg; 28.7 U.S. mpg), 1.6l/km less than the current version's. Inside the car's center console is higher bringing the gear stick closer to the steering wheel, a design seen in motor sports. The 911 has a visual impression of width, Porsche says. The 911's exterior mirrors are now mounted on the upper edge of the door instead of at the front of the windows to improve aerodynamics and emphasize the car's new design line and visual impression of width, Porsche said. Porsche starts taking orders for the car on September 1 and it will start to arrive in showrooms on December 3, along with the Carrera S variant, which has a 3.8-liter engine with 400 hp, up from 385 hp. The 911 Carrera will cost 88,038 euros in Germany, 2,500 more than the current model. 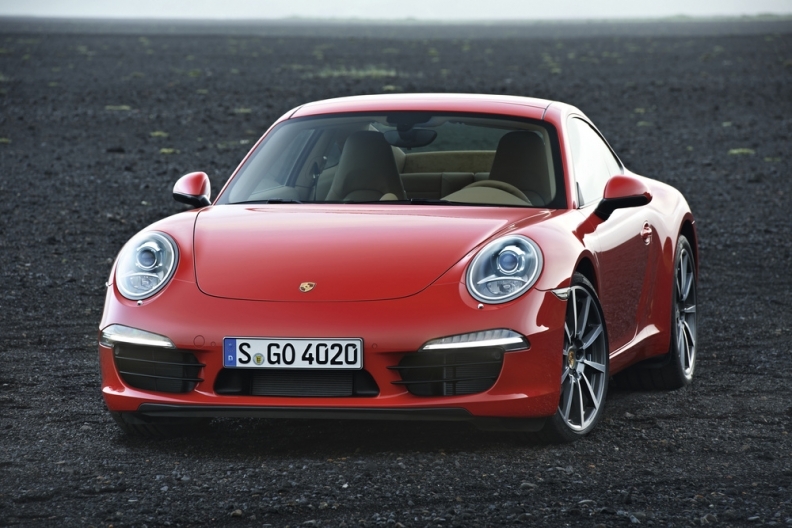 The 911 Carrera S will cost 102,436 euros. 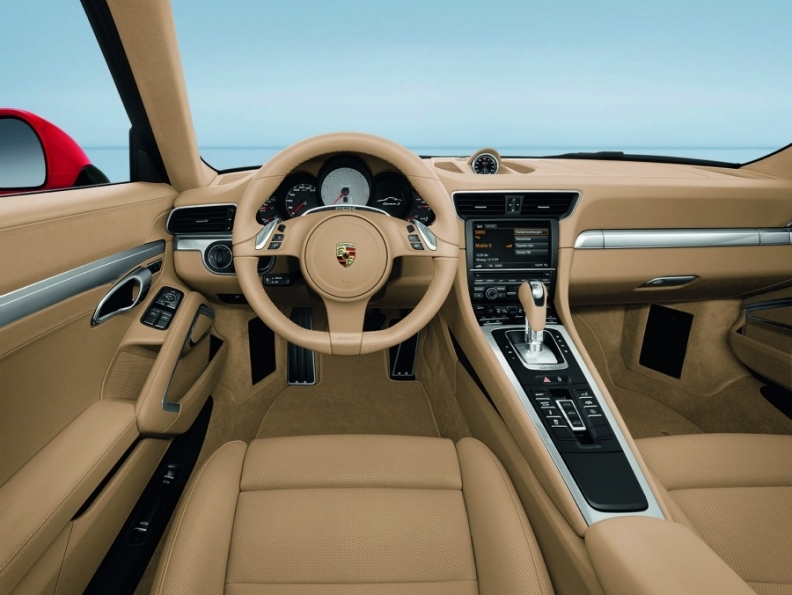 The 911's center console is higher, bringing the gear stick closer to the steering wheel. With products like the updated 911, Porsche aims to boost annual global sales to more than 200,000 units by 2018, up from 97,000 in 2010.